How to choose a good pressure washer for car? Who makes the best pressure washers for cars? Washing your car regularly helps maintain its parts and makes it operate like brand new even after a long time of use. An electric pressure washer is a great tool to get rid of all kinds of dirt from dust to mud and sap. Sun Joe SPX3000 has been CSA approved, which mean it has been tested to a Canadian or U.S standard to assure that the product has the top quality and will deliver exactly what is expected of it. Sun Joe SPX3000 has the max pressure of 2030 PSI and the max flow rate of 1.76 GPM. It sounds a little over-powerful for tasks like washing cars. However, you’ll need this power when cleaning the wheels/undercarriage after muddy roads. The washer is featured with 5 Nozzles – a 0 degree for the most difficult clean areas, a 15 degree for concrete/brick/hard surfaces with stubborn, a 25 degree for painted/wood/siding fences, a 40 degree for windows/screen washing, and a 60 for liquid soap. You can be reassured that you’ll have a suitable flow to wash from glass to undercarriage. The Total Stop System (TTS) helps automatically stop the pump when the trigger is not engaged to save energy, prolong pump life, and avoid unexpected accidents. The dual detergent tanks store different types of detergent to simultaneously tackle different cleaning projects within a push of a button. 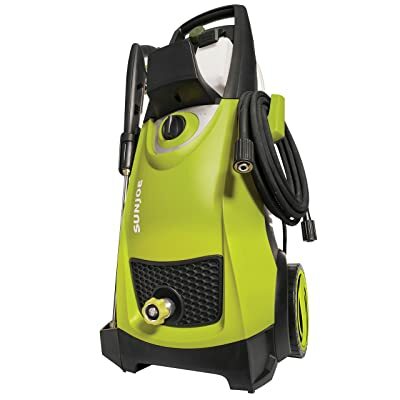 Sun Joe SPX3000 is the best pressure washer for cars that can handle all kinds of tasks. Karcher K5 Premium is a powerful washer with 2000 PSI max pressure and 1.4 GPM max flow rate – as powerful as Sun Joe SPX3000. One advantage of Karcher K5 Premium over Sun Joe SPX3000 is the convenience and the versatility thanks to the hose reel and the Vario power spray wand. The Vario Power Spray wand can be twisted to adjust the spray from 0 to 60 degrees. For more stubborn stains, you can change to the dirtblaster spray wand that produces a stronger rotating spray. 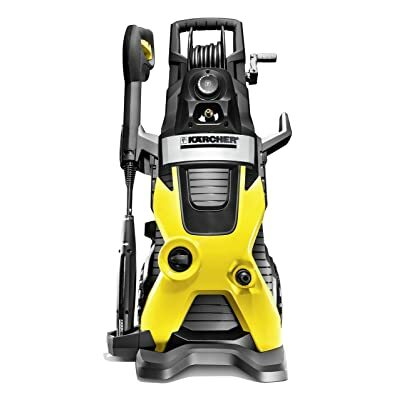 Karcher K5 Premium is also featured top technologies including N-COR pump and Water-cooled induction motor. These technologies make the washer last 5 times longer than normal washers. However, the big drawback of Karcher K5 Premium is the lack of TSS technology that helps to save energy and protect the motor. Karcher K5 Premium is a convenient washer for cars that allows you to adjust the spray easily. Greenworks GPW1602 is not a powerful washer. In fact, its max pressure is only 1600 PSI and its max flow rate is only 1.2 GPM. With this power, the washer is just enough for medium tasks, but you are assured that the paint surface won’t be scratched. In return, it has a compact design that can be used vertically or horizontally. The design giving you mobility and convenience. Greenworks GPW1602 has turbo quick connect nozzles – but there are only 2 tips. It also has an attachable detergent bottle for applying soap. Being a budget washer, Greenworks GPW1602 does not have many integrated technologies. The biggest omission is the lack of TSS technology. 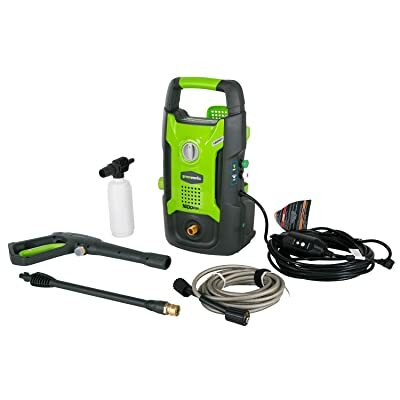 Greenworks GPW1602 is an affordable pressure washer that is suitable for cleaning the car’s body and window classes. PowRyte Works 1600 PSI is the most convenient washer for cars. It has an all-in-one nozzle, a compact and lightweight design, an external detergent dispenser, and especially an affordable price. The TSS technology helps to save energy, prolong pump life, and avoid unexpected accidents. Overall, PowRyte Works 1600 PSI is an easy-to-use and durable machine. However, it lacks some power – the max pressure is only 1,600 PSI and the max flow rate is only 1.6 GPM. 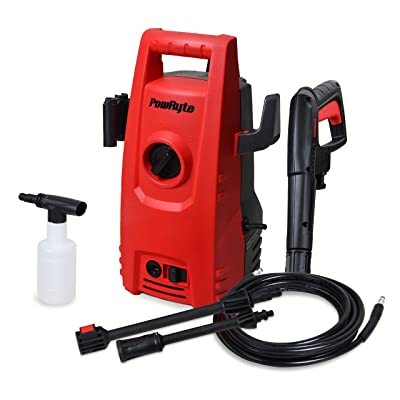 PowRyte Works is a convenient and energy-saving pressure washer for cars that got lots of positive feedbacks. AR Blue Clean AR390SS is an environmentally friendly machine that can save you up to 80% of water but 45% more powerful. The rotating spray nozzle along with max pressure of 2,000 PSI can wipe out all the dirt, mold, moss and grime. You’ll also have 4 different quick change nozzles for more various kinds of tasks. AR Blue Clean AR390SS has a smart design and a full set of accessories that add more convenience to users. The quick connect and the hose reel with extended length make the washer really easy-to-use. The TSS technology make the washer more durable and reliable. The onboard storage and the detergent tank make it more versatile. AR Blue Clean AR390SS is a convenient and powerful washer that can save you 80% of water. Karcher K3 Follow-Me is a unique washer that has a four-wheel base. The washer will maneuver around as you clean, so it is suitable for cleaning a long driveway. Karcher K3 Follow-Me comes with two wands. One is an all-in-one wand that is easily twisted to adjust sprays from 0 to 60 degree. One is a dirtblaster spray wand that uses to boost power up to 50% to tackle the hardest jobs in half the time. There is an integrated soap dispenser for you to apply soap and speed up the cleaning process. You also don’t need to maintain the washer much as it uses a maintenance-free non-corrosive N-Cor pump. However, the washer lacks TSS technology that can even enhance the machine lifetime longer. 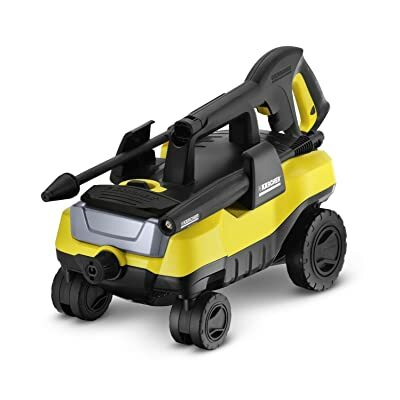 Karcher K3 Follow-Me is a mobile washer that is suitable for cleaning long driveways. Washing cars is typically not a hard cleaning task. However, sometime you’ll need high pressure and high flow rate to get the jobs done, such as when you need to clean the wheels/undercarriage after muddy roads. A washer that has at least 1,600 PSI of max pressure and 1.5 GPM of max flow rate is sufficient. Snow Joe and Sun Joe are brother brands that are specialized in developing innovative outdoor cleaning tools, whether the snow is falling or the sun is shining. They manufacture from lawn mowers, trimmers, tillers, to snow blowers and especially electric pressure washers. Being founded in 2004, Snow Joe and Sun Joe has built its awareness as a high-quality crafts-making manufacturer but still affordable for most folks. Snow Joe and Sun Joe have some great models of pressure washers for cars that you should take a look at. AR Blue Clean is a consumer line of pressure washers from Annovi Reverberi (abbreviated AR) – an Italian high-pressure pump manufacturer with 60 years of experience. Their products are all extremely easy to handle and offer high performance, safety, and quality that stand the test of time. 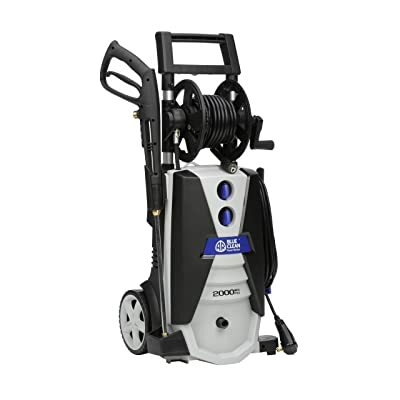 All AR Blue Clean electric pressure washers have a vast range of accessories, making every machine versatile and ready to handle all cleaning tasks. 2,000 PSI is safe for washing a vehicle. However, you shouldn’t use a 0-degree nozzle for washing window glass or the painted body or it will leave some scratches. Does pressure wash damage car paint? A pressure washer can cause damages or nicks on the paint, which could lead to rust later. You should not use the max pressure and narrow nozzles when cleaning the paint. It’s recommended that you should use less than 2,000 PSI of pressure and nozzles more than 15-degree. Yes. You can use hot water to effectively clean dry mud, oil and grease. However, you should follow the washer’s specification for the max temp of the water – typically, it’s under 40 degrees Celsius (104 degrees Fahrenheit). And you should not use hot water on the painted or wooden surfaces. How much water does it take to wash a car with a pressure washer? For a light task like cleaning the dust, you’ll need only about 5 gallons of water. For a full wash, it’s about 20 gallons of water max. What kind of soap do you use in a pressure washer? Soap is the favorite detergent to be used with a pressure washer as it is natural and biodegradable. Chemical detergent is a stronger cleaning agent than soap, but as a result, it can do damage to your car. It shouldn’t be used on painted surfaces. If you have to do so, make sure the detergent is diluted enough not to damage the paint. Above are my full review of the best pressure washers for cars. Hope that the information in this article will help you find the suitable washer for you.